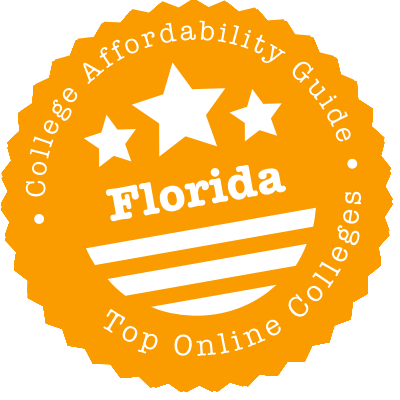 Scroll down to see the top not-for-profit colleges and universities in Florida offering online degree programs. St. Petersburg College is a Top 40 school when it comes to the number of students who attend exclusively through online classes, according to the U.S. National Center for Education Statistics. About 20,000 students choose from 560 online courses that are tied to more than 50 programs that can be completed online. The programs available to online students run the gamut from bachelor's degrees to short-term specialized certificates in fields such as technology and preschool education. St. Petersburg has a variety of associate programs, both for students who want to transfer to a four-year school and those seeking skills they can use immediately in their career. Bachelor's degrees include business administration, elementary education with teacher certification, and sustainability management. In addition to hundreds of courses in several study areas that are available on the Internet each semester, the University of Central Florida offers more than 40 undergraduate and graduate degrees and 29 certificate programs online. At the current time, there are 18 Bachelor of Science and Bachelor of Arts degrees available in fields such as anthropology, criminal justice, health services administration, religion and cultural studies, sociology, and technical education and industry training. UCF offers 25 master's programs online, including a Master of Science in Aeronautical Engineering (MSAE) with three tracks: space systems design and engineering, thermofluid aerodynamic systems design and engineering, and accelerated BS to MSAE. The Master of Social (MSW) degree is a cohort program that follows a seven and a half week cycle of delivery. Students accepted to the MSW program can choose from two specialization areas - behavioral health or child welfare services. UCF currently offers the following doctoral degrees online: Doctor of Philosophy (PhD) in Nursing, Doctor of Nursing Practice (DNP), and DNP - Executive Track. Students can earn graduate certificates in a variety of disciplines, including autism spectrum disorders, construction engineering, gender studies, research administration, systems engineering, and theoretical and applied ethics. Nova Southeastern University is a member of the Southern Regional Education Board's Electronic Campus program. As a participating institution, NSU's online programs and courses are certified by SREB according to its strict and comprehensive Principles of Good Practice. Bachelor of Science (BS) degrees are available the fields of business management, computer information systems, health science, psychology, and nursing. There are 43 Master of Science (MS) programs available in varying fields, including biomedical informatics, clinical vision research, education law, counseling, and instructional technology and distance education. NSU offers additional master's degrees in accounting, business administration, health science, international business administration, taxation, and public administration. The online Doctor of Occupational Therapy program requires students to come to campus for two to four days of intensive coursework at the mid-semester mark of the program. The remainder of the degree requirements can be completed over the Internet. Doctor of Philosophy (PhD) degrees are also available in computer science, computing technology in education, conflict analysis and resolution, and information systems. In addition, NSU currently offers 14 education specialist degrees and 6 graduate certificate programs. Online students have access to student services that include academic counseling, tutoring services, and the university's electronic library and online databases. Saint Leo University offers online degree programs at the associate, bachelor's, master's and doctoral level. Online associate programs are available in four disciplines: business administration, criminal justice, information technology and liberal arts. Online bachelor's programs are available in 16 disciplines, including business administration (with concentrations in accounting, logistics, management, marketing and project management), computer information systems, health care management, liberal studies, psychology, religion, sociology and criminal justice (with concentrations in criminalistics and homeland security). Additionally, the University offers over 25 online master's degrees, 10 online graduate certificates and one online doctoral degree. Online master's degrees are available in fields such as criminal justice, business administration, instructional design, social work, educational leadership and theology. All degrees can be completed entirely online except for the Doctor of Business Administration degree, which requires the completion of three one-week, on-campus seminars over the course of the program. The remaining doctorate courses are taken online individually in eight week sessions. Students in other online programs also complete courses in eight-week terms, with six eight-week terms offered each year. Saint Leo University offers financial aid to online students, including limited scholarship opportunities such as the $1,000 Military Family Scholarship for those enrolled in the online MBA program. Keiser University has four graduate programs, about 15 bachelor's degrees, and about a dozen associate degrees that can be completed online. The master's degrees are in business and management and the classes are delivered in Spanish. Some of the bachelor's programs are degree-completion program for people with associate degrees, and others are complete four-year degrees. All the bacchelor's programs are delivered in English, with a few also having a Spanish-language version. The associate degrees are offered in a variety of career fields. Keiser, which specializes in providing career-focused degrees for adult learners, ranked No. 52 on the 2017 U.S. News & World Report listing of Best Regional Universities South. Florida International University offers several fully online undergraduate degree programs. Students have the option of earning a Bachelor of Arts (BA) degree in communication arts, interdisciplinary studies, religious studies, sociology and anthropology, sustainability and the environment, and women's and gender studies. Online Bachelor in Business Administration (BBA) programs are available in finance, human resource management, international business, management, logistics and supply chain management, and marketing. Bachelor of Science (BS) programs are offered in criminal justice and in hospitality management. FIU offers 18 programs on the graduate level, including a Master in Public Administration (MPA) degree and Master of Science (MS) programs in fields such as special education, real estate, music education, global strategic communications, and forensic science. The Doctor of Nursing (DNP) degree available online can be completed in six consecutive semesters. In addition, there are several graduate and undergraduate certificate programs for students and working professionals who wish to enhance their knowledge or add to their current skills. Online students are eligible for scholarship opportunities like the Bright Futures Scholarship, which is for high school graduates who are also Florida residents. Online graduate students studying public administration may be eligible for the Public Policy and International Affairs Program. There are currently 14 undergraduate degree programs that are offered online from the University of Florida. Students can pursue Bachelor of Science (BS) or Bachelor of Arts (BA) degrees in diverse disciplines, including business administration, computer science, environmental management, anthropology, biology, criminology & law, and geology. On the graduate level, the University of Florida offers more than 70 online master's degree programs in 13 fields that include education, engineering, health and human performance, pharmacy, medicine, and public health and health professions. The online Master of Business Administration (MBA) program offered at UF's Hough Graduate School of Business was ranked No.3 in the country by U.S. News & World Report (2014). Doctor of Education (Ed.D.) degrees are offered in four specialization areas: educational technology, curriculum teaching and teacher education, educational leadership, and higher education administration. There is also a Doctor of Nursing Practice (DNP) degree available online, as well as Doctor of Pharmacy (PharmD) and Doctor of Philosophy (PhD) in Classical Studies programs. Online students are considered for the same scholarship opportunities as on-campus students. The Machen Florida Opportunity Scholarship program is designed to meet the full need of qualified students, including full or partial tuition remission, books, and fees. Florida State College at Jacksonville is in the running for the prestigious 2019 Aspen Prize for Community College Excellence, marking the second time the college has been named among the top 150 community colleges in the nation that are being considered for the biennial $1 million prize. FSCJ Online offers eight bachelor's degrees, eight associate degrees and more than a dozen career certificate programs that can be earned entirely through online coursework. Most online programs are in the fields of business or technology. To help students earn their degrees more quickly, FSCJ grants credit for prior learning to students who have qualified for certain industry certifications or who go through a prior learning portfolio review. University of South Florida offers 30 graduate degrees that can be completed entirely online and several undergraduate degree completion programs that can be completed partially online. The undergraduate degree completion programs allow students who have completed their general education requirements to complete their upper division degree requirements online. Some also require the completion of face-to-face internships, practica or clinical experiences. Degree completion baccalaureate programs are available in criminal justice, information studies, public health, information technology, nursing, women's and gender studies, and criminology. The University's 30 online graduate degrees fall into nine broad categories: arts, behavioral and community sciences, business, education, engineering, global sustainability, medicine, public health and an interdisciplinary degree in cybersecurity. These graduate programs may also include internships, practica or clinical experiences that are completed face-to-face. In addition to online degree programs, USF offers graduate certificates that can be completed fully or partially online. Fully online certificates are available in various disciplines within the broad categories of business; behavioral, counseling and community engagement; crime investigation/cybersecurity; education; engineering and technology; health and pharmacy sciences; public health; and sustainability. Broward College was named one of the top three community colleges in the nation in 2017, receiving a Finalist with Distinction award from the 2017 Aspen Prize for Community College Excellence. Broward College has online programs for students seeking career credentials as well as transfer degrees. Students with a specific career in mind can earn an associate degree in a field such as cybersecurity, accounting, or technology project management. Many technical certificates are offered online, too. Students who want to transfer to a four-year school can earn an Associate in Arts. The college also has Bachelor of Applied Science programs in fields such as technology management and IT. Some programs use accelerated courses with classes running for eight weeks. The University of West Florida offers more than 30 degree and certificate programs through its online campus. Online undergraduate degrees include Bachelor of Science degrees in career and technical education, information engineering technology, health sciences, nursing and network systems operations, as well as Bachelor of Arts degrees in exceptional student education, maritime studies, and teaching and learning. Online master's degrees are available in 13 subjects, including business administration, computer science, curriculum and instruction, English, exceptional student education, mathematics, nursing, political science and public health. An online doctoral degree in curriculum and instruction is also available. Additionally, UWF offers 10 undergraduate certificates and 10 graduate certificates. Undergraduate certificates are available in subjects like Arabic language and culture, business intelligence, public health, database systems and web development technologies, while graduate certificates are available in subjects like not-for-profit administration, human performance technology, public health and graduate business foundations. Online students at UWF are eligible for financial aid, including a tuition installment program and a short-term institutional loan program. Non-Florida residents admitted to online programs are also eligible for a tuition waiver, which covers a percentage of the out-of-state fee portion of tuition. Miami Dade College is the largest college in the United States, based on enrollment, and it grants more associate degrees than any other community college in the nation. The college also grants bachelor's degrees, and programs at both levels are offered through MDC's online division. Students who graduate from the online Associate in Arts program, designed for transfer students, are guaranteed the chance to go to a Florida state university. Eight career associate degrees are also available, mostly in business fields. The online bachelor's programs are degree-completion programs in fields such as nursing and public safety management. MDC also participates in FloridaShines, a program that helps students find and enroll in online courses at other state schools. Daytona State College has been named as having some of the nation's top online bachelor's programs for five straight years, according to U.S. News and World Report. In the 2017 rankings of Best Online Bachelor's Programs, the magazine included Daytona State programs in supervision and management, engineering technology, and information technology. Daytona State has four online bachelor's programs which have a 2+2 model, requiring students to complete an associate degree first, then complete their bachelor's degree. Daytona State also offers 10 associate degrees and 12 certificate programs online. The associate degrees and certificates are primarily in the fields of business and information technology. Seminole State College has a wide range of online programs, ranging from bachelor's degrees to career certificates. The college has three online bachelor's degrees, in IT, supply chain management, and health sciences. Applicants for these programs should have a relevant associate degree. Students who want to transfer to a four-year school can take the first two years of classes online and earn an Associate in Arts degree. All required general education courses are delivered online, and many of the lower level courses for some majors are also online. The online Associate in Science and certificates provide job skills students can use immediately in fields such as IT, business administration, and education. Students who want to complete their first two years of college classwork online before transferring to a four-year school have six majors to choose from through Hillsborough Community College's online degree programs. The Associate in Arts has transfer tracks in subjects including education, business administration, hospitality administration, and psychology. Students who want to gain career skills that don't require a four-year degree can earn a career associate degree or a college credit certificate. Career degrees available online include fire science technology, optical management technology, and criminal justice studies. Certificates cover business topics like management or operations, or technology topics such as database administration and game authoring. Every semester, the Indian River State College offers hundreds of online courses that can be applied towards the completion of an online or on-campus degree. Some courses follow a hybrid delivery format with periodic face-to-face sessions, while several others do not have on-campus components and can be completed entirely online. There are also associate and bachelor's degrees that can be earned 100 percent online. Students who complete an Associate in Arts (AA) degree satisfactorily have a guaranteed transfer to a Florida state university, such as the University of Florida or Florida Atlantic University. IRSC offers the AA degree online. Students who are interested in pursuing an Associate in Science (AS) degree can choose to earn one in either business administration or health information technology. Bachelor of Science (BS) programs are available in six areas of study: exceptional student education, information technology management/cybersecurity, middle school math, nursing, organizational management, and business administration. There is also a Bachelor in Public Administration degree offered online. Online students may be eligible for transfer scholarships if they are planning to continue their education in an IRSC baccalaureate program or in another Florida public institution. There are more than 250 fully online courses available each semester at Florida Atlantic University. In addition, there are courses that follow a hybrid delivery format that requires students to come to campus periodically for face-to-face instruction. The College of Business offers three Bachelor of Business Administration (BBA) degrees online: BBA in Accounting, BBA in Marketing, and BBA in Management (with a concentration in leadership and applied managerial skills). Additional undergraduate programs include Bachelor of Arts (BA) in Criminal Justice, RN to BSN, BA in Geography, and Bachelor of Public Safety Administration. FAU offers six graduate-level degree programs that can be pursued 100 percent online. These include: Master of Education (M.Ed.) in Curriculum and Instruction, M.Ed. in Instructional Technology, Master of Science (MS) in Exercise Science and Health Promotion, and three MS in Nursing programs (administrative and financial leadership, holistic nursing, and clinical nurse leader). Students accepted to the Master of Business Administration (MBA) program can choose to specialize in hospitality management or sport management. Partially online graduate degree programs are also available in the fields of education, computer science, and electrical engineering. At the current time, FAU offers online certificate programs in geographic information systems and in gifted education. Online classes are popular at Florida Southwestern State College, with about 20 percent of all credits completed being earned through online classwork. Online programs include business, education, and the health professions. Registered nurses, cardiovascular technologists, and respiratory care professionals can complete a bachelor's degree online. Nurses have an option to attend full time, part time, or very part time. Business students can earn a Bachelor of Applied Science in Supervision and Management or Public Safety Administration or earn an associate degree in accounting, criminal justice, or business administration. Online students can also earn an Associate of Arts, which prepares them to transfer to a four-year school to complete a bachelor's degree. Florida State University offers Bachelor of Science (BS) programs in the following fields that can be completed entirely online: public safety and security, computer science, criminology, and social science. The BS in Public Safety and Security degree has four areas of concentration: crime scene investigation, law enforcement intelligence, law enforcement operations, and police science. FSU currently offers more than 20 graduate level degree programs online, including a Doctor of Education (Ed.D.) in Educational Leadership and Policy, and a post-master's specialist degree in library and information studies. The Master of Business Administration (MBA) program offers specializations in hospitality and tourism management and in real estate. Master of Science (MS) degrees are available in diverse disciplines that include risk management and insurance, communication disorders, curriculum and instruction, special education, and social work. In addition, there are several non-credit certificate programs for students and professionals who wish to add to their skillset or explore a new field of study. Online degree-seeking students who are enrolled for six or more credits per semester are eligible for the same financial aid opportunities as on-campus students. Tuition assistance is available through the Access to Better Learning and Education Grant and the Florida Resident Access Grant. Southeastern University has online programs in six subject areas, and, depending on the subject, you can earn anything from an associate degree to a doctorate online. The business program includes bachelor's degrees, an MBA, and a certificate in business analytics. The ministry program offers an associate, bachelor's and master's in ministerial leadership plus a Master of Divinity. Educators can advance their career with a Master of Education in fields including special education and TESOL. Four degrees are available in the behavioral and social sciences. Southeastern also grants online bachelor's degrees in digital media and in criminal justice. Southeastern is affiliated with the Assemblies of God and teaches with a Christ-centered outlook. Pasco Hernando State College in Florida boasted an online course completion rate of 80 percent for Spring 2017. The college features five fully online degree programs and 12 certificates. All the certificates are undergraduate business, office and/or tech programs, with four reserved for different types of E-Business. As for the degrees, there's a two-year Associate in Arts degree that transfers, plus two baccalaureates: a Bachelor of Science in Nursing and a Bachelor of Applied Science in Supervision and Management. Students can select concentrations in Organizational Administration or Health Care Management. The Educator Preparation Institute, meanwhile, takes baccalaureate-holders without Education degrees and runs them through two semesters of content leading to a teaching certification. Polk State College has three online degree-completion options for students who have an associate degree. The Bachelor of Applied Science in Supervision and Management has five concentrations, such as healthcare administration, business information technology, and public administration. The college also has an online associate degree in business administration. The Bachelor of Science in Criminal Justice is a natural extension for students with an Associate in Science in Criminal Justice Technology, another online program of Polk State. Registered nurses with an associate degree or diploma can complete a Bachelor of Science in Nursing. Students who want to transfer to a four-year school can earn an Associate in Liberal Arts through Online@Polk State, the college's distance learning division. Tallahassee Community College has four online degree programs. Of these, the Associate in Arts degree is the big draw. By completing this degree, online students complete the first two years of a four-year degree and are eligible to transfer to a Florida public college as a junior. More than three-quarters of TCC grads transfer to a four-year institution. The college ranked No. 11 nationwide in the number of liberal arts and general studies associate degrees it awarded to African-American students in a study by the magazine Diverse: Issues in Higher Education. The other online programs are career degrees with majors in criminal justice technology, early childhood education, and paralegal and legal studies. The online programs at College of Central Florida allow students to earn an associate degree while enjoying the flexibility of asynchronous classes. The Associate in Arts degree is for students who will enter a bachelor's program, either at Central Florida or another college. Online students have access to all the needed courses. A.A. students can be sure their credits will easily transfer to one of 11 universities in Florida. Students with more immediate career goals, such as gaining credentials in criminal justice or early childhood education, can also earn their associate degree entirely online. Central Florida also has a dozen online certificates, covering everything from equine technician to an engineering technology Lean Six Sigma Green Belt. Pensacola State College has about a dozen programs that students can complete entirely online, including certificates and degrees. PSC is a community college, but it also offers a few bachelor's programs, and one, a degree-completion program for registered nurses, is available online. At the associate level, PSC has several transfer degrees for students who plan to continue their studies at a four-year school. Options include general studies for students who haven't selected a major, business, and criminal justice. Several online programs are advanced technical certificates, which are for students who already have an associate degree in a related field. PSC offers advanced certificates in project management, law enforcement administration, and human resources. Florida Gulf Coast University offers four bachelor's completion programs, four graduate degrees, and some teaching endorsements through its distance learning programs. Distance learning classes include online learning, but some online classes may have a face-to-face requirement. Students who have completed all the lower division courses can take distance learning classes to complete a Bachelor of Science in Health Sciences, B.S. in Criminal Justice, or B.S. in Legal Studies. The Bachelor of Science in Nursing is available to registered nurses. Coursework for Florida Gulf Coast University's MBA is available entirely online. The Master of Public Administration program also allows students to complete their degree online. MPA students can concentrate in public leadership and management or environmental policy and planning. The Master of Science in Health Science is a 36-credit program that students can complete through online coursework. The online Master of Arts in Curriculum and Instruction: Educational Technology program is designed for students who work in training for business and industry as well as for K-12 teachers. Students seeking a Master of Education in Special Education can complete the online program in about two years. Everglades University offers 11 bachelor's degrees and four master's programs in an online format. Master's programs include an MBA with concentrations in accounting for managers, aviation management, construction management, human resource management, and project management. The master's in aviation science has concentrations in aviation security, aviation operations management, or business administration. The master's in public health administration has a concentration in complementary and alternative medicine. A master's in entrepreneurship is also offered online. All the online undergraduate programs result in a Bachelor of Science. Students can major in alternative medicine, alternative and renewable energy management, construction management, crisis and disaster management, business administration, environmental policy and management, land and energy management, international business, surveying management, or hospitality management. The online B.S. in Aviation/Aerospace offers concentrations in management, aviation security, airport operations management, aviation safety, flight operations, or aviation maintenance management. Online students have access to online trainers and a help desk during business hours. Students can access online tutoring and library services 24/7. Hodges University offers a variety of online degree programs, primarily in professional fields such as business, computer information, and health care. In addition to traditional programs, Hodges has an option of self-paced online programs for motivated students who have prior learning, work experience, and college credits they can apply towards their degree. These competency-based programs, which go by the trademarked name UPOWER, charge a flat fee for six months of unlimited access to coursework at the graduate or undergraduate level. UPOWER programs are available for a master's in information systems, public administration, or visual communication; or for a bachelor's in computer information technology, cybersecurity and forensics, digital design and graphics, or software development. Traditional online masters are available in accountancy, business administration, clinical mental health counseling, health services administration, information systems, legal studies, management, public administration, and visual communication. Traditional-styled, online bachelor's degrees are offered in accounting, applied psychology, business administration, computer information technology, criminal justice, cybersecurity and forensics, digital design and graphics, health services administration, interdisciplinary studies, legal studies, management, marketing and professional sales, and software development. Hodges also offers associate degree programs in a traditional online format and through the UPOWER program. The following education-focused Master of Science (MS) degrees are currently available online from Saint Thomas University: MS in Educational Leadership, MS in Elementary Education, MS in Instructional Technology, MS in Reading Education, MS in Special Education, and MS in TESOL (Teaching English to Speakers of Other Languages). These programs do not have any residency requirements and can be completed 100 percent online. The MS in Educational Leadership degree offers a specialization in Charter School leadership, while the MS in Special Education program has a specialization in autism spectrum disorders. A Doctor of Education (Ed.D.) in Leadership and Management program is also available online. New students accepted to any of the MS programs above may be eligible to receive $2,000 in scholarship money; qualified Ed.D. students can receive up to $5,000. Saint Thomas offers three other graduate-level degrees online - Master of International Business (MIB), MS in Sports Administration (MSSA), and MS in Big Data Analytics (MSBDA). Students accepted to the MIB program are considered for a $2,500 scholarship. Additionally, there is a Priority Commitment Award of $1,000 given to each eligible student who enrolls in any of these programs well in advance of the priority deadline for each degree. The Florida Institute of Technology (FIT) offers several online degree and certificate programs in the fields of accounting, aviation, business, criminal justice, healthcare, information technology, liberal arts, and marketing. Courses for FIT's online programs are delivered asynchronously, giving students 24/7 access to class lectures and study materials. The Nathan M. Bisk College of Business at FIT offers a Master of Business Administration (MBA) degree that can be pursued entirely online. By enrolling in 12 eight-week courses, students can expect to complete the program within two years. The areas of specialization include: accounting, finance, healthcare management, information technology management, international business, management, marketing, and project management. The following Master of Science (MS) degrees are currently offered online: MS in Information Assurance and Cybersecurity, MS in Information Technology, and MS in Supply Chain Management. Students accepted to the MS in Information Technology program can choose to specialize in one of three fields: cybersecurity, database administration, or enterprise resource planning. FIT has a number of Bachelor of Science (BS) and Bachelor of Arts (BA) degrees available online, most of which do not have a residency requirement. The BA in Applied Psychology programs offers concentrations in child advocacy, clinical psychology, forensic psychology, and organizational psychology. Students who complete an online Associate in Arts degree from Northwest Florida State College are guaranteed the opportunity to enroll in a four-year state school. The degree is available with eight online majors, ranging from accounting to social work. The college also has online associate programs in fire science technology and emergency administration. Unlike many community colleges, Northwest Florida also grants some bachelor's degree, and it has three online degree-completion programs: management and supervision, nursing, and early childhood education. The degree-completion programs are for students who already have an associate degree, although nurses with a diploma are also eligible. Florida Gateway College offers one online program, a Bachelor of Applied Science in Water Resources Management. This is a degree-completion program designed for students who already have an associate degree in environmental science technology. Depending upon their associate degree, students might have to take additional general education requirements or foundational courses. Applicants to the program must have a GPA of at least 2.0 for their previous college work. The program includes 15 lower level pre- or co-requisite classes that students may take before or after entering the degree program, 21 core credits, nine credits in water resources electives, nine credits in management electives, and three electives in either water resources or management electives. There is also a foreign language course requirement. Florida Gateway developed this online program to meet Florida Governor Rick Scott's challenge to create an affordable four-year degree. The program prepares students to work in the areas of water conservation, water resources, or in a water policy-making position. The Adventist University of Health Sciences offers an RN to BSN program that can be completed online in just five consecutive terms. Although the program is not designed to lead to licensure or certification, it is accredited by the Accreditation Commission for Education in Nursing (ACEN). The university's online Bachelor of Science (BS) in Radiologic Sciences degree is degree completion program that requires applicants have an associate degree in radiography or nuclear medicine technology. Those who do not have this necessary academic background will be required to take an additional 27 credit hours of relevant coursework. A BS in Diagnostic Medical Sonography degree is also available 100 percent online and can be completed in as few as 24 months. The university offers two graduate-level programs in the field of health administration, both of which can be pursued online: the Master of Health Administration (MHA) in Strategy and Innovation and the Executive Master of Healthcare Administration (EMHA). MHA students who start the program with an associate's degree can expect to earn the degree in 36 months, while students with a bachelor's degree typically complete the program in 24 months. The EMHA degree can be earned in as few as 19 months. Almost all the online programs offered by the University of North Florida can be completed online without any required visits to campus. Online options range from a doctoral degree to a bachelor's degree-completion program. UNF ranked No. 46 in the U.S. News and World Report rankings of Best Online Graduate Education Programs. Online programs open to educators include Master of Education in Educational Leadership: Instructional Technology, Graduate Certificate in Early Childhood Education, and Graduate Certificate in TESOL. The doctoral programs are Doctor of Clinical Nutrition and Doctor of Nursing Practice. DNP applicants must have a Master of Science in Nursing. The online Master of Science in Nutrition and Dietetics is delivered in eight-week accelerated terms, as is the bridge program for registered nurses who want to complete their Bachelor of Science in Nursing. Other programs offered fully online include the Graduate Certificate in Sports Management. The Master of Science in American Sign Language/English Interpreting has concentrations in general practitioner and interpreting pedagogy. The course content is offered using a variety of technologies, and some face-to-face sessions are required. However, students who do not live in northeast Florida have the option of participating in these sessions through online technology. The School of Professional Career and Education (PACE) at Barry University offers the following online programs in the field of administration: Bachelor of Public Administration (BPA), Master of Public Administration (MPA), Bachelor of Science (BS) in Administration, and a Master of Arts (MA) in Administration. The submission of an experiential portfolio is required for the BS in Administration degree. Students who prefer to have an area of specialization (instead of a portfolio) will have to enroll in on-campus classes. The MA in Administration program is comprised of 36 credit hours and includes coursework in topics such as human resources, finance, project management, and information technology. PACE also offers BS in Emergency Management and BS in Health Service Administration programs online. The College of Nursing and Health Sciences at the university has four online degrees available - Doctor of Occupational Therapy, Doctor of Nursing Practice (DNP), post-master DNP program with a specialization in anesthesiology, and a post-master practice doctorate degree in occupational therapy. Students accepted to the DNP program can expect to earn the degree within five semesters, or two academic years including the intervening summer term. DNP students will be required to attend one on-campus session while enrolled in the program. The University of Miami offers several online degree programs on the graduate level that can each be completed in 26 months or less. These include: Master of Business Administration (MBA, 26 months), Master of Science (MS) in Finance (16 months), MS in Sport Administration (20 months), MS in Health Informatics (22 months), MS in Nursing Informatics (22 months), Master of Public Administration (MPA, 24 months), Master of Arts in Communication (24 months), and Master of Professional Accounting (16 months). Students accepted to the MBA program begin the program with an introductory weekend visit to the university's Coral Gables campus. There is also a week-long residency in the Miami campus, at which time students will be required to enroll in one accelerated course that will be counted towards their degree. Students have the option of completing a general MBA program or focusing their studies in one of three areas: corporate finance, financial decision making, and accounting practice. At the current time, online certificates are available in accounting, finance, and health informatics. A new online degree program - Bachelor of General Studies - was begun in September 2016. Qualified online degree students can be eligible for up to 35 percent tuition discount. Baptist College of Florida allows students to complete the coursework for almost all its degrees in an online format. Online classes follow the same semester calendar as on-campus classes follow, but the content is usually asynchronous so students can participate in class when and where it is most convenient for them. Master's programs offered online lead to a Master of Arts in Christian Studies or a Master of Arts in Music and Worship Leadership. Both master's degrees are 30-credit programs. All the bachelor's degrees that BCF awards are Bachelor of Art degrees. Undergrads can major in fields including biblical studies, Christian studies, English, history, social studies, Christian education, ministry studies, psychology, business leadership, education, missions, or music. One of BCF's more unusual programs is a Bachelor of Arts in Missions with a concentration in aviation, allowing ministry students to take certified flight training as part of the degree. BCF also offers associate degrees that are designed to prepare students for pastoral ministry. Associate degree programs are offered in divinity, Christian education, and music. The Sunshine State is overflowing with distance learning options, so it can be challenging to pick just one! That’s why we put together this quick guide to choosing an online program in Florida. Here you’ll find links to online degree catalogs, useful tips on the 2+2 program and Complete Florida, info about potential out-of-state discounts, and more. We also profile a number of affordable universities and Florida schools with serious quality concerns. Whatever your budget, you deserve a solid online credential. Southern Regional Education Board (SREB) Electronic Campus has partnered with a number of southern universities—including lots in Florida—to offer an online program & course catalog. You can search for online or blended programs, “degree completer” programs that are designed for adult students, or even a specific course! Programs marked “E” are offered at the Electronic Rate, which means the in-state and out-of-state tuition rates are the same. Public and private institutions in Florida are featured in this catalog, including schools in the State University System (e.g. University of Florida, University of North/South/West Florida, etc. ), the Florida College System (e.g. Broward College, Eastern Florida State College, etc. ), and independent universities (e.g. Embry-Riddle Aeronautical University, Nova Southeastern University, etc.). Check the list of participating institutions for your preferred school. The FloridaShines website, which is a service of the State University System of Florida (SUSF) and the Florida College System, has a helpful Course Catalog where you can search for distance learning courses in Florida’s public universities, state colleges, or community colleges. Alternatively, you can use the catalog to search by online degree level. One thing to note—if you’re researching distance learning, you’ll often see references to the Florida Virtual Campus (FLVC), which provides distance learning services to the K-20 community. The FLVC website redirects visitors to FloridaShines and its course catalog. Florida’s innovative 2+2 Program means that students who earn a two-year associate degree at a state college are guaranteed admission to a bachelor’s program at one of the state’s 12 public universities. However, you don’t get to choose which public university that is. If you’re a current state college student, you can check your eligibility & course requirements for the 2+2 Program on FloridaShines. Better yet, online course credits can be easily transferred from one Florida public university or college to another. According to the FloridaShines section on Online Learning, “under state policy, all state public institutions must accept credit for courses offered by another state public institution.” Talk to your individual state school or community college about your transfer options. 4. Going Back to School Online? Check Out Complete Florida! Complete Florida is designed to help Florida residents who have at least some college credit and want to finish their education. The organization has teamed up with colleges & universities throughout the state to offer 100+ online undergraduate degrees and certificates. These flexible, accelerated programs are tailored to folks like working adults, parents, military and veterans, and almost anyone seeking to advance their career. But, wait, there’s more! Complete Florida students are assigned a personal college coach, who can help with paperwork, financial aid, credit transfers, scholarship searches, and the application process. Each student also has access to MyCareerShines, a career and education planning system. The website has a breakdown of how the whole program works and how to apply. It’s important to know that the SREB also runs the Academic Common Market-Electronic Campus (ACM-EC). If you can’t find certain online programs (e.g. Doctor of Nursing Practice), and you’re considering applying for out-of-state online degree, you may only need to pay in-state tuition rates. You can search for programs available to students living in Florida using the ACM-EC list. There are a few warnings, though. If a public college or university in Florida already offers a degree program in your chosen field of study, you won’t be eligible for discounts on tuition. And approved ACM-EC programs must be in one of the 15 participating SREB states. To apply, you will need to meet admissions requirements of the college or university that offers the program and be certified as a resident of Florida by an ACM coordinator. Visit the website for instructions. To be featured below, these universities & colleges needed to appear on both our “Top Online” and “Most Affordable” lists. That means they had to meet our tough criteria for quality, flexibility, price, and use of financial aid money. (You’ll see a CAG Score next to their profiles in our ranking.) If you like what you see, but can’t decide between options, check out the student-driven statistics (e.g. graduation rate, average debt load, etc.) on College Scorecard. FAU Online has a list of all its online programs, with details on both hybrid and 100% online degrees. Each individual degree page (e.g. BBA in Marketing Online) has a breakdown of in-state vs. out-of-state costs per credit, which includes associated fees. In the quality stakes, FAU’s graduate programs tends to do moderately well in U.S. News & World Report online rankings. Thinking about starting with community college to save money? FAU has a LINK program with Broward College, Indian River State College, and Palm Beach State College. LINK students complete their associate’s degree at a state college and then move on to FAU. This is different from the well-known 2+2 System, because the LINK program guarantees admission to FAU. FGCU’s Distance Learning website has details on all of its online degree programs and courses, as well as answers to FAQs. You can learn about your financing option through FGCU’s Office of Financial Aid & Scholarships. That’s not all. Thanks to partnerships with online curriculum providers like Ed2Go, Career Step, and Infosec, FGCU’s Office of Continuing Education offers a ton of online professional development and training courses. These include programs in cyber security, healthcare administration, business, life skills—the list goes on. Distance Learning at FSU is one of the heavyweights. It has great online rankings, strong faculty, and a goodly amount of undergraduate and graduate programs. The FAQ has a section on What Does it Cost? ; the cost of each online course is typically equal to tuition plus a distance learning fee. As long as they’re seeking six credits or more per semester, all degree-seeking online students hold the same financial aid eligibility as campus-based students. Some online graduate programs offer market rates to attract out-of-state students. We weren’t kidding about the rankings. In U.S. News & World Report’s summary of FSU’s Online Programs, you’ll see that FSU’s online graduate programs are particularly strong. In 2018, FSU appeared in the Top 10 of Best Online Graduate Criminal Justice Programs, Best Online Graduate Business Programs (Excluding the MBA) and Best Online Graduate Computer IT Programs. The scoop on UCF’s extensive online programs can be found at UCF Online, and the page on Costs has a handy breakdown of tuition & fees for undergraduates and graduates. (Students enrolled in a UCF Online program receive a waiver of certain campus-based fees.) Once you’ve made your choice, the Office of Student Financial Assistance has details on applying for financial aid, and UCF’s Student Success Coaches can assist with the process. Transferring from a state college? UCF’s Transfer and Transition Services website is designed to help. It explains how credits transfer and provides a list of useful resources. More importantly, UCF academic advisors and peer mentors provide transfer students with free guidance on topics like choosing a major, Transfer Credit Equivalency, the General Education program, and more. UCF also participates in the 2+2+2 program, which allows students transferring from a local state/community college to finish the bachelor’s and master’s degree portions of their education entirely online. Talk to the school for more details! UF’s website on Distance Learning has the most comprehensive info on its online degree programs, as well as certificate programs, non-degree courses, continuing education options, and MOOCs (offered through Coursera). Having said that, UF Online has a lot of facts on its 100% online bachelor’s programs, including tuition & financial aid. Like FSU, UF has a number of online graduate programs that have been approved by the State of Florida Board of Governors for a market rate tuition. UF participates in the 2+2 program, but you don’t have to start with a community college. UF’s Pathway to Campus Enrollment (PaCE) allows incoming freshmen to begin their UF degree online. PaCE students must enroll in UF Online for at least two semesters and earn at least 15 credit hours. Once they have completed the prerequisites for their major and a total of 60 credit hours (up to 45 credits may come from previous college credits like AP, IB, dual enrollment, etc. ), students can request a transfer to campus. UF is generally considered to be an excellent deal! It was #2 in Kiplinger’s 2017 report on Best College Values (Public Colleges) and #6 in Washington Monthly’s 2016 report on Best Bang for the Buck – Southeast. These stats are backed by outstanding U.S. News & World Report rankings for some of UF’s Online Programs, particularly its Online MBA Program, Online Bachelor’s Programs, and Online Graduate Education Programs. Details about UNF’s online degrees and certificates are listed on the university’s Distance Learning website, including links to current tuition & fees and financial aid. In addition to traditional online programs charged with standard tuition, UNF also has it calls Online Accelerated-Term Programs (e.g. Doctor of Nursing Practice). These programs may not follow the traditional format of other degrees and may be shorter in length. They also have non-standard tuition rates (e.g. market rate or cost recovery tuition). USF’s Innovative Education website contains info on its online programs (hybrid and online), graduate certificates, distance learning testing services, and a whole lot more. However, it’s the Office of Admissions that has the most up-to-date info on the Cost of Attendance, including tuition & fees and Florida residency requirements. USF claims to have one of the lowest tuition rates in the country and—just like UF and FSU—it does well in U.S. News & World Report rankings for its Online Graduate Programs. USF’s Office of Veteran Success also runs a number of initiatives to support its military students. For example, there is an Academic Enhancement Program, which includes help from an academic counselor or academic coach, and the Berkman Scholarship for full-time undergraduate and graduate level student-veterans, and full or part-time doctoral student-veterans. USF is one of only 16 universities in the nation to offer the Tillman Foundation Scholarship. It’s easy for shoddy and unaccredited schools to hide in a state as large as Florida, so please be careful about choosing an online degree. Wherever it’s based, a school should be fully accredited by an organization recognized by the U.S. Department of Education. Although national accreditation applies to distance learning institutions, regional accreditation is the gold standard, especially if your thinking of transferring credits. The Southern Association of Colleges and Schools Commission on Colleges (SACSCOC) provides regional accreditation for degree-granting higher education institutions in Florida, including schools that offer associate degrees. The homepage allows you to search for accredited institutions by state. The SACSCOC also regularly announces its Accreditation Actions. This will tell you if your Florida school has recently received a Warning or Probation because of quality concerns. Warning is the less serious of the two sanctions. If you want to double-check these results, the Council for Higher Education Accreditation (CHEA) Database provides a full list of regional & national accreditations for every university in the country. A number of Bible-based and Christian colleges in Florida do not have recognized accreditations. Here are a few more Florida online schools that we found significant concerns about. Also known as Almeda College, Almeda College & University, or Almeda International University, Almeda University has a long history of issues. It claims to have accreditation from the Interfaith Education Ministries (IEM) and the Association for Online Academic Excellence, but neither of these bodies are recognized by CHEA or the U.S. Department of Education. It does not appear in College Scorecard or the CHEA Database, and it holds no recognized national or regional accreditations. This school does not appear in College Scorecard or the CHEA Database, and it holds no recognized national or regional accreditations. AIU claims to have accreditation from the Accreditation Service for International Schools, Colleges and Universities (ASIC), but it does not appear in College Scorecard or the CHEA Database, and it holds no recognized national or regional accreditations. This is a well-known diploma mill that holds no recognized national or regional accreditations. In 2010, Jason Morris, President & Chief Operating Officer at EmployeeScreenIQ, exposed how he was able to purchase a worthless master’s and PhD from Gordon University for $295. Heed University does not appear in College Scorecard or the CHEA Database, and it holds no recognized national or regional accreditations. Miami International University of Art and Design is a for-profit institution. It is regionally accredited, but “after a review of a monitoring report and financial statements originating with the submission of news articles regarding the financial health of its parent corporation,” SACSOC continued to place the school on Warning in December 2015. In other words, SACSOC had concerns about the institution’s financial stability. This Warning will be reviewed in December 2016. According to the CHEA Database, Remington College is nationally accredited by the Accrediting Commission of Career Schools and Colleges (ACCSC), but it is not regionally accredited by SACSOC. Remington was originally for-profit. The New York Times reported that Remington College, a “Florida-based for-profit school, was sold to a nonprofit with the owners lending it $136 million for the sale” in 2011. The school came under strong criticism in The Century Foundation’s 2015 report, The Covert For-Profit. South University is a for-profit school owned by the Education Management Corporation (EDMC), which has been criticized for its aggressive & misleading recruitment practices. The university is regionally accredited by SACSCOC, but College Scorecard reports that the Tampa campus has an extremely low graduation rate and a lower than average percentage of students paying down their debt within three years. The stats for the West Palm Beach campus are roughly the same. University of Phoenix is a for-profit institution headquartered in Arizona. According to the CHEA Database, it is regionally accredited by the Higher Learning Commission (HLC), but it’s been hit with a number of lawsuits over the years. College Scorecard reports that the Orlando campus has an low graduation rate and a lower than average number of students paying down their debt within three years of graduation. Southern Association of Colleges and Schools Commission on Colleges (SACSCOC) : Also known as SACS, this is the regional accrediting body for degree-granting higher education institutions in southern states, including Florida. Use the homepage to search for accredited institutions by state. Complete Florida: Founded by the Florida Legislature, this program is for Florida residents who have at least some college credit and want to finish their education via an online degree. If you become part of the program, a college coach will guide you through the process of choosing an accelerated/flexible degree at a quality university. FloridaShines: The FloridaShines website and the Florida Virtual Campus are intended to help students earn a college degree and embark on a bright career. The website has tons of tips and tools on going to college, finding the right school, choosing an online course or degree, earning & transferring credits, applying for financial aid—you name it. FloridaShines Course Catalog: This catalog allows you to search for distance learning courses in Florida’s public universities, state colleges, or community colleges. You can also search by online degree level. Southern Regional Education Board (SREB) Electronic Campus: Use this website to search for online degree programs or courses being offered by participating SREB institutions throughout the southern states (e.g. Florida public universities, state colleges, and non-profit private universities). The Electronic Campus also has a section on financial aid, answers to FAQs, and advice for veterans/military.